Simon sat still on the rock. The sun was at that point where you couldn’t see it anymore but the colors in the sky betrayed the position it so recently held. There were cushions of clouds that reflected the gold and orange and rose before they pushed into the purple that was on it’s way to deepest blue. The black shape whirling through the sky came ever closer then darted away again. It had the power to kill Simon in one swipe or one breath of it’s fiery nostrils if it chose. Silence and stillness were the test and if he failed there wouldn’t be a second chance. The last pass was close enough that the sunset colors glinted off the green scales and the indigo of the evening sky could be seen though the nearly transparent skin of the wings. It was cold but still Simon sat. He had travelled for days to get to Weyr Rock and that was after years of trying to learn it’s location. The knowledge had been common at one time. The dragons hid their home by way of magic, for survival. He knew that they were aware of his presence. He had felt the magic going out around him. It made his skin tingle, and the air smell like lightening. Long ago, before these kings and their wars, magic was known. Now, politics and intrigue had pushed it aside. Wizards who once held kingdoms together and kept the evil at bay, were in hiding like the dragons. The land was cold and dark for most. The poor, the powerless, they were the ones protected by magic and now, they were on their own. Once a month at the full moon, he had gone to the mountain and Nuala left her moon for one night and they would dance and talk until morning when she would have to return. It was one such night that she told him of the Weyr Rock and how to travel there. The kings had had their time. It was time to bring magic and dragons back. The green and bronze monster circled closer each time and though he had trumpeted a warning to others, he alone showed himself. Dragons had their own politics and this one must be very powerful to have kept the rest from killing Simon. Out on the edge of the rock I had set an offering basket of herbs and apples. There were blueberries, borage, bracken, hawthorne berry, and lots of chamomile and garlic. The hawthorne berries were out of respect for the fae. The old stories told of Dragons love for chamomile. He prayed that Nuala would guide him as the dragon came to rest on the rock, his beautiful scaled tail curling around the outcropping. He bowed his head towards the basket and gently flicked his tongue at the treats. He turned his gaze at Simon and blinked, his scaled lids momentarily covering the lapiz iris and black slit of a pupil. He nodded his head for Simon to speak. Simon told him of the wars and the hunger in the land. He spoke of wizards and fae in hiding because with no dragons they became nothing but pawns for whatever bloodthirsty king had possession of a patch of ground. Simon told him that he had seen the caves on the mountainside where dragon and human once life bound themselves to each other. He had seen chamomile growing wild among the rocks. The people were ready. They needed dragons. The dragon nibbled a bite of food from the basket. His huge but somehow delicate wings were folded gracefully and as he ate, puffs of smoke came from his nostrils, an ever present reminder of his power to char Simon to nothing. The dragon looked at him and Simon heard his voice in his head. The dragons lips never moved but he spoke to Simon as clearly as if he was next to him. “I am the eldest and remember the days when we lived together in harmony and white magic was strong in the land. I will talk to my brothers but only if you go along.” He blinked again. Simon heard the challenge in the voice in his head. Simon knew without a doubt, that if he was unable to convince the dragons to help, he would be killed. It was enough that he had found Weyr Rock. They would never let him leave if he held their secret lair. He stood and stared for a second at the moon as it rose. He asked the dragon to lead him there. The dragon chuckled then. “This is no place you can walk to. There is only one way to get there.” He laid his head down so that his neck was stretched out and Simon could see a natural place just above his wings, just right for a rider. He gathered his cloak and climbed upon the dragon. He grabbed the offering basket and before he could say he was ready, the dragon took off. Simon was flying! He might not live through this night but by the gods, he was riding a dragon! He glanced at the moon and could have sworn he could see it smiling at him. They soared across the top of the mountains. Simon was too excited to be afraid. He yelled with the exhilaration and the dragon laughed. The wind whistled past and in the cold silence, Simon felt the closeness of the moon, of Nuala. He felt alive. He felt hope. This entry was posted in Reluctant Wizard, Sunday Scribbling, The Pen on December 13, 2009 by Dee. Simon had grown over the winter. Spring revealed someone caught somewhere between a boy and a man, trying to grow into longer limbs and a voice not his own. He and Nuala had met throughout the long winter, walking in the snow to a sheltered grotto. He had built a fire pit and they would huddle next to the fire and tell their secrets. One night Nuala stood next to the fire and threw some herbs and stones into the fire and brightly colored sparks soared into the air. She closed her eyes and began to sing a song in words he had never heard. She spoke of the moon and sadness to come and then sat and wept. He didn’t know what to do so he just sat with her until she grew quiet again. The cold and sadness seemed far away now. He walked a little faster and his heart was beating a little harder as it always did when he was going to see her. He had never thought of himself as anything special, but through her eyes, he was a magical slayer of dragons, a mage with the wisdom of the ages, a healer, a king. He would never understand how he had been so lucky to find her, but she made him want to be more. Hands went around his face and covered his eyes as he walked along the bank of the stream. “Who could this be? he asked laughing. He whipped around and her hands came loose, and as he spun, he was face to face with her, just inches between them. She had Tiger lilies woven into her hair, as though a crown and the sun made her brown eyes sparkle. She took his hand and they continued walking along the bank. Shafts of sunlight wandered down through the trees and the birds were singing. She turned, pulling him with her into the trees and he followed as she led. The forest became thicker and they had to step over fallen trees and push aside underbrush. He asked no questions, just held on to her hand and went where she went. They came into a clearing he had never seen before. 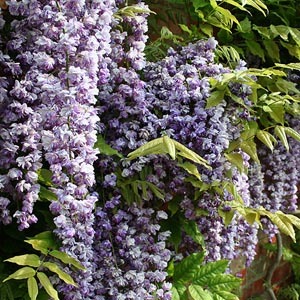 Purple wisteria climbed high into the trees and turned the clearing into a chapel. Every trunk, limb, rock was draped in purple, perfuming the air. Simon craned his neck around, taking it all in. It was a magical place, a gift Nuala shared with him. She held both his hands and they spun around and around as the birds provided music for their dance. They nearly collapsed laughing and dizzy. He reached out to remove a sprig of grass from her cheek and she froze in place. He leaned forward and gently touched his lips to hers. The forest went completely silent. For a moment there was nothing in the world but them. She stood very still and when he drew back, neither said a word. There was no need. There would be more winters and sadness would come as it comes to all of us. For now, there was spring and flowers and a first kiss, and love warm moving across their lives as sure as the spring moved on to summer. This entry was posted in Reluctant Wizard, Sunday Scribbling, The Pen on October 3, 2009 by Dee. Nissa woke to rain dripping off the leaves of the ivy that had grown lovingly around the giant old oak. She had curled up in the cradle made by roots that had wandered out and down through the cool dirt. Leaves that had fallen over years and velvety moss had made this a favorite summer spot to daydream. Daydream and watch the old man work his garden. She had spent more and more time here lately. Her mum had changed and while she was never mean, she was just sort of not there. Nissa couldn’t really put a name on it, she frightened her. She used to sing while she worked and she would hug Nissa and chase her around the yard laughing, more like a sister than a mother. These days she just went through the motions. The house was clean and supper was cooked, but she never smiled or sang and when she wasn’t working she would sit at the table and stare at the fire as though she were waiting for something. She never spoke unless you asked her a question. Nissa shivered though the shower that had blown up wasn’t cold. She sat up and scooted up closer to the trunk where she could watch the rain but stay dry . The smell of the rain on the dirt, honeysuckle from somewhere nearby, and the wet herbs in the garden filled her nostrils and she closed her eyes and breathed it in. She felt much better out here, away from the house and her mother and whatever it was that seemed to be hanging over their heads like a dark and heavy cloud. She hesitated. She always felt safe and peaceful here and her instincts had never brought her harm. She liked coming here and if he told her to stay away she would have nowhere else to go. She weighed all that against her empty belly and stood up and walked to his porch. “You are Nissa.” He said. She jerked her head up in surprise. He had not only known she was there but he knew her name as well! “I am Simon.” he said and he held out a bowl of stew to her. She took the bowl, thanking him and he gestured to a seat and another piece of bread. She sat down and they ate in silence. She mopped up the rest of the liquid in her bowl with the last of her bread and sighed in contentment.. Simon handed her his bowl and asked her to set them in the washpan in the house. She stepped in the room and it took a moment for her eyes to adjust and then they widened in curiosity? Delight? She didn’t know where to look first! There were drawings and stuffed birds, carvings and odd stones of all shapes and colors. She remembered she was holding the bowls and carefully put them in the tub of water. She backed towards the door, wishing to explore but not wanting to be rude. “Who was this Simon?” She wondered. When she stepped outside, Simon had his eyes closed and his head leaned up against the wall, The rain had stopped and the sun showed wrinkled skin, translucent and almost glowing from within in the sunlight. His white hair was long but braided and he smelled like Rosemary. She sat down in the sun near him and he began to tell her about the plants in his garden. She had been watching him tend them, trimming some that got too adventuresome and pulling weeds from around others that seemed to prefer their space. He often hummed and sometimes spoke quietly as he cared for them. “There is a heartbeat to the earth and if you listen carefully, you will hear it beating in a garden. The seasons have a rhythm all their own and the earth will speak to you. Whatever you give, you get back so much more.” He told of plants that were for healing, plants that made food taste better, and some that were for love and beauty. “I like the ones you can eat, the best.” Nissa told him. Simon smiled and said that the earth would feed more than just your belly. “That may be so,” Nissa said, “but it’s hard to think of anything else if you are hungry.” She looked away from him as she said it. “Then you may come to this garden anytime you wish.” Simon said. “Will you teach me how things grow?” she asked..
“Yes child, but it is work and you have to be willing.” He smiled seeing more than she knew. Simon saw that she was strong and brave and would not be able to resist a challenge. He had dreamed of a child for the last few nights, and of something dark that she was running from. He couldn’t see clearly yet, just what it was. He only knew that he must help her and that he had to go slow so that whatever it was would not awaken before he had taught her enough to help him defeat it. “I can do anything you ask me to do.” she said proudly and maybe a bit defensively. She had her chin stuck out as though she was daring him to disagree. Simon just smiled and said “Then I shall see you tomorrow.” Though she didn’t want to, she squared her shoulders and headed towards her home. She didn’t want him to know how scared she was of going back to her mother and she was afraid that he would find out that something was wrong there and send her away. She would show him that she could help. She would make herself indispensable and then he would never send her away and she would have a place to go, to be, to grow. She even whistled a bit on the way home. The sound died on her lips as she reached the house. She quietly slipped around back and through the window into her room so that she wouldn’t have to see the vacant stare in her mother’s eyes. She quietly wrapped herself in her quilt and as the sky grew dark, she huddled in the corner of her bed and finally fell into a troubled sleep. This entry was posted in One Word, Personal, Reluctant Wizard, Sunday Scribbling, The Pen on September 14, 2009 by Dee. “Simon – run along and play, I’ve work to do,” Mum brushed a damp strand of hair back from her forehead. There were good smells coming from the pot on the fire and she was sweeping yesterdays dust out the door. “Yes mum.” he called as he jumped over her broom laughing and ran out into the sunshine. He waved at his Da out in the garden as he ran past and headed to the woods. It was a warm day and the cool shade was beckoning. He followed the path he had worn through the trees to the creek and tossed stones at turtles sunning on a log as boys will do. He watched as they left their log and dove into the cool water. He found a great crooked stick and carried it with him, whacking trees and plants as he walked along. He ventured farther than he usually did, lost in daydreams. The sound of singing came to his ears and he changed direction to get closer and see where it was coming from. As he climbed through bushes he saw a place where the sunlight slipped between the leaves and bathed a small clearing in golden light. A girl sat with a hat of many colors on her head. He slipped closer, hidden by trees and his eyes widened with wonder. He started to make the sign to ward off evil but something told him there was no evil here. What he first thought to be a hat was butterflies of all kinds, covering her hair and back which was turned to him. Her arms were held out from her sides and sparrows and larks and robins flew in and landed and flew off again, fearless and singing. Her melody seemed at one with the birds and the light fell all around her like a warm blanket. He stood very still and silent, just watching. The girl looked to be about his age, with long brown hair and a flower chain around her neck. She stopped singing and turned smiling. “Come out boy.” she said. Simon quietly walked over and sat beside her, amazed that the butterflies didn’t leave. They seemed to sense that she was a safe haven. “Are those apples, you have in your tunic?” she asked. Simon had found an apple tree in his ramblings and picked a few and tied them up in his tunic to eat later. He nodded and took them out. Polishing one on his britches, he held it out to her. “Thank you.” she smiled at him again and he felt like her smile was warmer than the sun. It seemed to light her from the inside and he felt as safe as the butterflies. They sat and shared apples and told each other many things. “Then how do you call the creatures to you and they have no fear?” He asked. She told him that you have to be as quiet in your heart and let the magic of the world come through. He didn’t really understand but it didn’t matter. He would listen as long as she would speak. Simon and Nuala met most days for the rest of that summer. It was the last summer they would truly be children as trouble and adulthood would soon come to them in the valley. For these days, at least, sunshine, apples, and the beginnings of true love carried them through the season. As Simon woke from the dream, he felt again the fullness of heart that had been his as a young man. No matter the destination and the sadness that eventually came to pass, he would never regret those days for they had brought him Nuala and the love that had lasted throughout his life, from that forest all the way to the moon and back. This entry was posted in One Word, Personal, Reluctant Wizard, Sunday Scribbling, The Pen on August 23, 2009 by Dee. Simon was slowly regaining his health. Word had spread in the valley that he had returned and soon folks would “pass by” to get a glimpse. As he got stronger he would take his staff and wander around his house in the afternoon sun. He would rest when he was tired and as he sat on a bench in front of his house the children came and sat around him and begged for stories. “Shh” he said with his finger to his lips and a twinkle in his eyes. “If you get still I will tell you how our valley came to be so beautiful”. The children scooted up closer and waited expectantly. “Tsk Tsk, this will never do.” she said as she stepped out on the porch. The vista before her was all black and white and gun metal gray. She picked up her box of supplies and walked into the scene. On one side of her walked a lion and on the other a lamb. She reached into the box and drew out her favorite brushes and began to paint. She took blue and white and mixed the perfect shade of sky and using wide strokes, applied light and air and wispy swirls of cloud. She took a tiny detail brush and with just a few flicks, birds wheeled and twirled. “That’s better.” she thought. Fine lines in the distance and suddenly geese flew in formation. The lion swished his tail and she nodded and smiled, “you’re right, we need to plan for morning and night.” and she added bright orange and deep rose in the west for the sunset to find and midnight blue so the night would have a place to hang the moon and stars. Lavender and pink blended in the east to invite the sun to rise. The lamb nudged her with it’s nose and she nodded in agreement. She dipped her fan brush in the forest green and painted in towering pines, dabbing with black and gold for shadow and light, little brown pine cones to finish them off. Now for some oaks and elms. Bushes and shrubs and grasses to cover the earth and give the smaller animals something to nibble on. She looked around at her work and was happy. She took browns and golds and reds and gave the dreary houses clothing that warmed them and made yellow light to spill out of windows with blue curtains waving in the breeze. “That’s so much better.” she told the lion and lamb. One last thing to be done. She took her pen and drew loving and peaceful words over the first house and an angry argument ended. Lullaby lyrics written into the next house and a fussy babe slept. A poem from the street and the an artist sitting at his desk began to write. She turned and as she wandered back to her home she sang softly and tree branches sighed in the wind, birds sang, and insects spoke of the changing seasons. Her supply box was lighter and so was her step. She reached her porch and set the box down and settled into her rocking chair. Her friends curled on the porch at her feet, sleeping peacefully. The gray was still there, but love had painted over it with beauty and the world was new with magic. She grew sleepy and as she dozed, the shadows grew longer and night fell. The darkness was so jealous of the colors she brought that it locked her in the moon and that’s where she lives to this day. The children all clapped and didn’t notice the sadness in Simon’s eyes when he finished the tale. “Go home children, your mothers will be calling you for supper.” he told them and stiffly got to his feet. The children wandered home calling out goodbyes as they went. They would look out their windows in wonder that night. They would dream of a beautiful woman looking down on them smiling over her valley. This entry was posted in One Word, Personal, Reluctant Wizard, Sunday Scribbling, The Pen on August 8, 2009 by Dee. Avery walked along the path to Simons’ house, munching on one of the crisp apples that hung on the tree at the side of the path. He had snatched it and several more as he passed by. The morning was just beginning to lighten as the sun climbed a bit higher and it felt good. He had this sense of anticipation, like something was about to happen but examining his feelings, there was no apprehension. Maybe something good then. He checked the traps he had set the day before and found he had snagged a nice fat rabbit. There would be meat in the stew tonight! He tied the rabbit to the side of his pack and continued on. As he rounded the corner by the stream that ran next to Simons’ house he saw something in a heap next to the front door. Dropping his apple, he started running yelling “Simon!”. Oh, don’t let him be dead! He got to the door and felt his pulse. It was weak, but he was alive. He half carried and half drug him inside and put him on the bed. Simon moaned, as Avery got a drink of water and brought it to his lips. Avery held him up to drink and then lay him back on the bed. He could see no wounds but the old man was skin and bones. He had never been fat but he seemed much older and more frail than one year of being gone should have caused. He covered him with a quilt and set about cleaning the rabbit. He left him long enough to go outside to the garden that he had been tending ever since Simon disappeared. He gathered vegetables and herbs and washed them off in the stream. He brought everything back into the little house and got a fire started in the fireplace. He filled a pot with water and hung it over the fire to start heating. He chopped herbs and added them and next the vegetables. While it was heating, he finished cutting up the rabbit and added it to the stew and soon the pot was bubbling and the smell of thyme, basil, garlic, and onions filled the house. He hoped that good food and rest would set Simon back to rights. He wondered for the hundredth time, where the old man had been this last year. He started to move into his house several times but though he spent a night there sometimes, he couldn’t shake the feeling that it belonged to Simon. It was almost as if the house waited for his return. He had kept it clean and tended the garden. He had tried to use what Simon had taught him to help the folks that came looking for medicines and advice. It never seemed enough and he missed Simon. Throughout the day he watched over him, occasionally coaxing him to drink. He seemed to be resting easier and by evening, he was sitting up to drink and holding the cup himself. “Do you think you can sit at the table?” Avery asked him. Simon nodded and Avery helped him to a chair. He set a bowl of hot stew in front of him and some apple slices. He added a hunk of bread he had in his pack and fixed himself a plate and sat across from him. Simon ate silently but finally looked up at Avery with a small smile and nodded his thanks. There would be time for questions later. For now Avery was just glad he was back. Simon ate most of the stew and softened the bread with some of the broth. He even ate a few slices of apple. He chewed every bite slowly as though he wanted to hold the taste in his mouth. When he was through, Avery helped him back to bed and he slept again, but he had more color in his face. Avery cleaned up from their meal and went outside to sit and smoke a pipe. The owl was back in the tree in the front yard. He hadn’t seen him since Simon left. The moon was rising and the nightbirds were singing. It seemed that all of the world was welcoming Simon back. Avery sighed and went in to sit watch for the night. He closed the shutters and as he did he stared at the moon which for some odd reason seemed infinitely sad and lonely tonight. He shook the feeling off, just happy that his anticipation had been real. He made himself comfortable in Simons’ rocking chair, not wanting to take his eyes off him. The folks around would soon notice but they would leave gifts for his needs and respect his privacy until he was ready. There would be a time when he would have to tell Simon about the evil that had crept into the valley. For now, rest Simon and welcome. This entry was posted in Reluctant Wizard, The Pen on August 2, 2009 by Dee. I’m having a twitchy, can’t think of anything, don’t like it if I do week. This is for a pile of prompts including One Word Shallow, Sunday Scribbling, Where in the world, Carry On Tuesday, and Three Word Wednesday. Every inch of the back wall in the little room was tiled. Thousands upon thousands of little bits of multicolored pieces of glass and pottery. A mountain of rainbow chaos where someone had reached in, swirled their hand about, and caused a fantasy of ethereal beauty. There was no way this was done by human, it had to be fae and even so over a long period of time. There was power in it and a history before time was counted. How I had even managed to get to this room had to be accidental and now that I was here I wanted to back away before they became aware that I had seen it. It would not be something they would want me to know about. I wanted to back away, but couldn’t. The magic in the color held me spellbound and I felt as though I were falling into it. A jerk on my arm brought me back to my senses. I shook my head and turned to see Fin pulling me backwards shading his eyes.. “Come on Nissa, don’t look!” I pulled my self away with no small effort, back into the darkness outside the doorway. “What was that?” I asked Fin. “I don’t know but as soon as you stepped inside I could almost feel a hum in the air. Made the hair on the back of my neck stand up! There is strong magic in there.” He said. The picture was still in my mind though many details were missing. I could still feel it’s powerful hold, though it weakened when out of view. It was too much to take in all at once. The flowers were colors not seen in nature and words were swirled through the design “Love is a flower that grows in color” in purple and gold. When I stepped inside it seemed at though lights bounced from a place far above and reflected the mosaic in a shallow pool in front of the wall. Even now I was drawn to it. “Nissa, you have to control yourself.” Fin said. Some of the corridors in the caverns were in complete darkness and others were dimly lit from skylights. There was a main room off to the left that we had traveled through to get here that contained illuminats left by mages. Illuminats were spelled rocks that held light from the sun for years. At least I hoped it was years. I had no desire to run into a mage. We sat down on a rock and Fin pulled the map out of his pack. “That room doesn’t show up anywhere on the map!” He said. “Is that all? Nissa, if we go back in that room we might never leave it!” Fin said. “You know the Fae like riddles and puzzles! We just have to unravel this. Simon sent us on this quest for a reason. Think back to his exact words. Maybe there was a clue in them somewhere.” I told him. “Something about using what we have to get what we need. So lets take stock. We have rope in your pack. What if we tie it outside the door to anchor us. We can tear blindfolds. If we can’t see the mosaic it won’t have as much power.” I said. “Fin, I’ve already been close to the wall – you haven’t been under it’s spell and besides, you are stronger. I will need you to pull me out.” I knew he was going to argue but he also would have to admit that my way made the most sense. We tore strips of cloth for blindfolds and some more to bind our wrists together in case I tried to let go. Fin tied one end of the rope to an outcropping of stone outside the door. He wound some of it around his waist, giving himself slack. We tied the blindfolds on, leaving them down til we were ready. Fin tied his wrist to mine and I felt a tingle of fear. What if I ended up nothing but bones at the bottom of the pool? Simon wouldn’t have sent us here if it wasn’t important. Whatever was at the bottom of that pool could help everyone in our valley so we would get it for Simon! We pulled the blindfolds down and entered the doorway. We moved slowly with our eyes covered. I tried to remember what the floor of this cavern room was like but I had been so mesmerized by the tiled wall that I didn’t pay it any attention. “Are you okay Nissa?” Fin called to me. I reached down and picked up a piece of glass about the size of my hand. “ouch!” I cried. I had cut my hand. “It’s okay Fin, I just cut myself a little on a piece of glass.” I moved forward some more. My toe edged ahead and felt the beginning of the pool. “I’m going to wade in slowly.” I told Fin. I was a little nervous walking in to the water. What if there was a trap or a deep hole? I just had to trust that Fin would get me out. “I don’t feel anything, Fin. I’ve gone all the way across and there’s nothing!” Now what? We had to be right. Maybe we were doing things wrong. “I’m going to take off the blindfold, Fin.” I told him. I was already pulling it down, I knew he would say no but I couldn’t stand coming this far and then leaving and maybe what we needed was right there – I just couldn’t see it. Outside the room we removed rope and blindfolds and wrapped the stone and put it inside Fin’s pack. We stared at each other for a moment and then headed back the way we came, map in hand. Simon would be waiting for us. As we crossed the great room, the room we had just left, lit up as daylight and then the door disappeared as though it had never been. This entry was posted in Carry On Tuesday, One Word, Personal, Reluctant Wizard, Sunday Scribbling, The Pen, Three Word Wednesday on July 30, 2009 by Dee. “I cannot stay and cannot go” He said. His eyes filled at the thought of leaving her but he missed his home and he knew he was needed. Could he deny himself and go? There was nothing but pain in this decision but he would do what he must. He smiled at Nuala and held out his arms to her. The music was playing and they began to dance slowly, swaying with it. She laid her head on his chest and listened to his heartbeat. “You will be old again and in pain. I can’t bear it.” She sighed. “I know” He said softly. “You know my heart.” He hummed softly and began to sing with the music. “The red rose whispers of passion and the white rose breathes of love. None can compare with the beauty, of my lady and the moon above…” As he sang the last words she found her arms empty and wept. He was in the cave again and his body that had been young and healthy for his too short time with Nuala had aged and the feelings, the aches and pains, hunger, thirst, all came upon him in waves. He slowly opened his eyes and looked around. The wall was covered with runes of protection. He knew that the cave would have been hidden by magic and so undisturbed until he returned. There was no fire and he was cold but more he needed nourishment. There would be nothing til he made his way down to the valley, to his home. He slowly got up, saw his pack and staff, laying where they fell a year ago. He opened the pack and sprinkled the herbs that were left on the floor of the cave in gratitude for the gift of the last year and for returning him safely. He pulled on his cloak and once again took up staff and pack and set off. He had forgotten how painful each step was and he carefully and slowly climbed down from the cave, wishing for the path to be easier, but knowing that everything has it’s price and the cost for a year with Nuala would be great. His breath became labored and he was shaking from weakness but he kept going. Holding to branches, and clutching his staff he continued, nearly weeping from the struggle. At last the ground evened out a bit and the going was not as tedious. The sun was coming up higher. He had been traveling in the half light of early dawn and was grateful for the light and the warmth. How he had missed the sun! The morning birds were waking and singing in the trees and the sounds of earth animals coming out of their burrows to greet the day. He walked on, weariness slowing him and yearning for home moving him forward. He finally reached the edge of his beloved valley and smiled as he walked just a tiny bit faster. Home was waiting. Finally he reached the path that led to his house and as he stumbled forward, the sun was kind to him and warmed his bones, the same old bones that had dreamed of a lady in the moon. He staggered to his door and with barely enough strength to push it open, thankfully entered the home he had missed. He dropped the pack and staff and loosened his cloak. He drew some water from the old pump and drank thirstily. He toyed with the idea of eating but it would have to wait. He all but fell on his bed and slept til the sun set, knowing nothing for those hours. He woke with the moon and stepped outside his door to gaze up at the glowing iridescent orb that held his heart. It might have been his imagination, but he could have sworn that Nuala wept a tear that became a shooting star. It lit up the night sky over his valley for just a second and then as quickly as it appeared, was gone. There is a storm coming in and it meant cloud cover at the track this morning so I got an extra lap in and then came home and helped finish mowing the lawn. Perspiration seems to equal inspiration 🙂 Come on sweet rain! This entry was posted in Carry On Tuesday, Personal, Reluctant Wizard, The Pen on June 29, 2009 by Dee. I had also used the prompt “intersect” but couldn’t find the link to the site – here it is. One Single Impression. Simon finally gave up on sleeping. He rose and stoked up the fire. The night air was warm but he felt a chill in his bones anyway. He put water on to boil and made himself tea. The fire threw shadows on the old wood walls and made his white hair glow like it was on fire too. He sighed as he drank his tea. His bones told him that he was too old to be about this kind of business but the dreams didn’t care about old bones. They came every night now. It had been so long since he slept through the night he wasn’t even sure he was asleep when they came. He knew he was at an intersection. He could stay on his life path and be comfortable, healing the people who lived in the valley; or follow the dreams. He knew if he chose to stay that there would be terrible consequences for more than just him. When he had drunk most of the tea he swirled the dregs and stared into the leaves hoping for answers. As usual, none came. Morning would fall over the valley soon and if he got an early start he might make the mountains before nightfall. He packed some hard bread and cheese and filled a skin with water. He gathered some herbs and wrapped them with the food in an extra cloak and got out a piece of parchment and some ink and a pen. He wrote a note saying he had gone on a journey and would return when he could. Whoever found the note was welcome to shelter and any vegetables that might be left in the garden. He knew it might be awhile before he returned to his valley and his hut. It made him sad to think about but when the dreams called, they didn’t take any notice of creature comforts. Simon hoped that in his absence the warm little hut would hold the spirit of hospitality and kindness would still be dwelling here waiting for him. He threw some of the ground herbs and dried flowers on the fire. Sweetpea for friendship, rosemary for blessing, and anise for protection and purification. He said a prayer as the herbs burned and then doused the fire with water from the stream that flowed nearby. Simon tied his white hair with a leather thong and hooked the clasp on his cloak. He grabbed his bundle and his carved walnut staff. He slid his knife into his boot not because he wanted to but because the dream told him to. He didn’t relish the thought of hurting another living creature but he could if he had to. He took one last longing look around and opened the door. The darkness wrapped it self around him like another cloak but he didn’t need light to start on this part of the trip. The path from his door was so well worn, his feet knew the way even if his eyes hadn’t been able to see shadows that hinted at approaching dawn. He heard a mourning dove cry and an owl in the old walnut that shaded his hut, complained. The smell of spring was all around and he wondered if he would ever see his home again. Maybe it was better leaving in the darkness. His heart might turn him around otherwise. Simon headed east and crossed fields and a brook. As the night slowly gave way to early purple morning he continued walking. No one saw him leave, there were no close neighbors and it could be days before anyone knew he had gone. He had taught Avery all he could about his herbs and healing. Avery was a good lad and would help his friends if need be. He would miss them all. The purple gave way to grey mist and that slowly lightened to blue. He could see the mountains in the distance now and though the path was gone, he knew the way as clearly as though the land itself was drawing him further and further from home. The grass became sparser and the path now led upward as he entered the foothills. Simon saw a rabbit out for his breakfast and then watched as a hawk swooped down and grabbed him. He shivered, wondering if this was an omen. He felt his muscles protest as the climb grew steeper. The sun was climbing as well and he knew that before long the heat would be unpleasant. Still he climbed. He could turn and look over the whole valley now. He spared one look and then squared his shoulders and turned away, climbing over rocks and around trees. He knew from the dream visions that he was getting close to his destination. As he clutched a tree branch to help himself over the next outcropping he spied the opening in the cliff above. It was dark against the sun drenched rock and he felt a chill even though his cloak seemed to be holding in the heat now. He finally climbed over the last rise and stood at the entrance to a small cave. Simon sat down under the shade of a tree nearby and opened his bundle. He took out a water skin and his bread and cheese. He poured a few drops of water out for the local gods and ate his meager feast. He left a few crumbs for the squirrel that was watching from up in the tree and tied his pack up again. He rested for a few moments and then sighing, he rose and entered the cave. There was a torch just inside and next to it in a little hollow in the rock was a piece of flint and some steel. He took it out and struck sparks to light the torch and when it caught, he replaced the flint and took the torch and carefully moved deeper into the cave. Near the back wall was a pile of skins and a fire ring. There was a snake coiled on the skins and he chased it away with his staff. He moved the top skins back and underneath was a book. The book was thick and black and covered with dust. He wasn’t surprised. Everything he had seen in the dream had come to pass. He carefully picked up the book and replaced the skins. He sat down on the pile of skins and using the torch, he lit the tinder in the fire ring. It was cooler in the cave and the fire would keep the snakes away. He sat the book on his lap and slowly opened the front cover. It was made of wood and the boards were bowed and creaking. It had an old smell to it, like something ancient and unknowable. The pages were cracked and yellowed. He took his pouch of herbs from his pack and as he turned the pages the flames leapt up and a face began to appear. To the flames he added Bay for protection and Lambs Ears to guard against harm, Borage for courage, Sage for wisdom, Camphor to help see and remember, and Lavender for love. As he added the herbs the flames changes colors and slowly the face became clearer. It was a face he knew nearly as well as he knew his own, though it had been years since he’s seen her. She was his soul mate and he had grieved her death his entire solitary life. As he looked upon the face in the flames a single tear made it’s way down the creases in his sun baked, furrowed cheeks to rest in his snowy beard. How could this be? How could she have lived all this time and he not know it? Yet here she was calling from the dreams. He turned the page in the book and spoke the words on the page in the language of the old ones. Her face became clearer still and she looked back at him with such love that was brighter even than the fire. He turned the page again and traced the runes with his gnarled fingers. As he did, she became more solid, less ethereal. He looked down at his own hands and could almost see the page through them. It was more difficult to hold the book now but he strained to turn the page again. Once again he spoke the words on the page and as he completed them the book dropped back to the skins and the fire winked out. Hours had passed without notice and the sun had set once again. A dove mourned and a snake hurried out of the cave, no longer interested in curling up on the still warm skins. Then night sounds returned and a light rain began to fall, erasing the tracks to the cave. As quickly as it began, the rain ceased and the clouds evaporated as the moon reflected not one, but two faces, forever smiling down on the dark as stars sang to the reluctant wizard and his lady. This entry was posted in Personal, Reluctant Wizard, Sunday Scribbling, The Pen on June 9, 2009 by Dee.